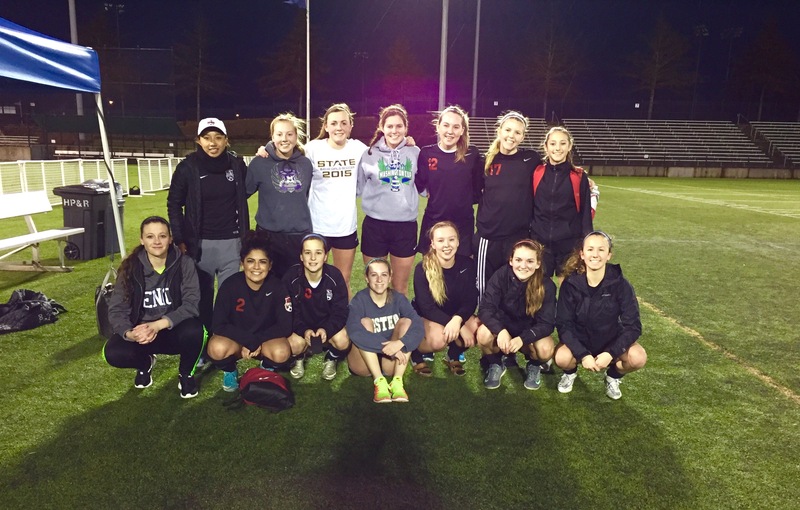 This past weekend, our U18 girls team, coached by Joana Houplin, traveled to Oregon to participate in the 13th annual Portland Winter College Showcase. The showcase welcomes teams all across the Northwest region, our neighboring states, and even Canada. Over a hundred college coaches and recruiters were in attendance, and our U18 girls had some great opportunities to show off their talent. Before the weekend even began, the odds were slightly against the team. Due to recent injuries, only eleven of the original teammates were able to make the trip. This left them with zero subs. However, with the help of two last minute guest players, Alex Cortright and Annie Hughes, these girls pulled out incredible results! The first game was Saturday afternoon and they came out with an astounding 3-0 win. Center Forward, Camryn Cross and Center Mid, Annie Strom each put a goal in to end the first half at 2-0. Megan Wilburg, playing at Fullback, scored the final goal. Attacking Mid, Edie Breckenridge gave two assists. The second game was against what would soon be the team that took 1st in the Showcase. Although the final score was 1-5, the team held them to only one goal in the entire second half. Wilburg scored her second of the weekend on a PK after Breckenridge was fouled in the box in the second half. Game three was a tough match up, but the girls fought hard and they secured a huge 4-2 win over the girls Crossfire ECNL team. Camryn Cross scored two goals with assists from Annie Strom and Edie Breckenridge. Cross also worked with Fullback, Suzanne Kaltenbach, to set Lydia Peplinski up for a clean shot on goal. Wilburg snagged her third, with an assist from Holding Mid, Alyssa Slotemaker. The final game was an exciting one to say the least. With three games under their belt already, the girls were getting worn down but still had enough of life and energy left. At the half, they were down 2-1. Kaltenbach scored their only goal in the first half, off of Slotemaker’s corner kick. Coach Houplin made a few adjustments at the half, and the girls went back onto the field with a renewed fire. Wilburg’s fourth and final goal of the weekend was scored on another PK – this tied the game up. As the clock wound down to the final ten minutes, the girls continued to find ways to dominate every play. The final, and game winning goal came from Edie Breckenridge who capitalized on a great set up from Camryn Cross. Charmaine de Wit was in goal all weekend and did an amazing job. These girls played some astounding soccer, and it paid off. They tied for 4th place out of twenty-five teams. Incredible! They undoubtedly caught the attention of coaches and recruiters. Coach Houplin says she is “very proud of the team’s performance with the roster [they] had. [Her] main players stepped up and worked hard, playing four games in three days with almost no subs. [She] saw a lot of leadership this weekend,” and she knows that this was a key factor to coming out with such great results. Did we mention that one of the two subs who filled in at the last minute was a player from Houplin’s U14 Premier team? Houplin was very pleased with the performance Annie Hughes brought to the field. She saw some playing time, and held her own with the older players. “I saw her confidence grow in every game,” Houplin said. Northwest United FC is always looking for ways to put players in advanced situations to push their skills and confidence – perhaps not a four year difference, but this goes to show that our players are being trained, prepared, and supported to face any challenge they are up against. This will be the girls’ final season together, and we are looking forward to discovering what the future holds for each of them. 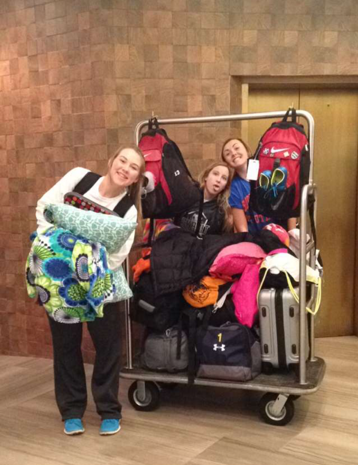 Congratulations on a successful weekend, ladies!